Marilyn SanClemente June 2, 2014 June 2, 2014 New catalog, Stampin' Up! Yay! The New Stampin’ Up! Catalog is LIVE today! Click HERE to visit my online store to place an order! Click on SHOP in the upper right corner. So what is my favorite new product?? The Blendabilities. Please note that the Blendabilities will not be availabl e to order when the new catalog goes live. A projected date is the end of June or the first part of July. Stampin’ Up! is building up their inventory to meet what they expect to be an overwhelming demand for these fantastic new alcohol based markers. 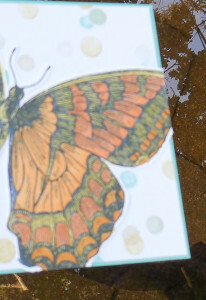 Here is a sample of a beautiful butterfly that my sister colored over the weekend with the pumpkin pie and daffodil delight markers. I love the vibrancy of the new Blendability markers! Check it out HERE or give me a call. Happy Stamping!